As we inch closer to spring, the season of rejuvenation, it might seem like a good idea to tidy up your room and invest some time and energy into redecorating your space. Lucky for you, Kidzworld has some great do-it-yourself ideas for creating some amazing wall art! 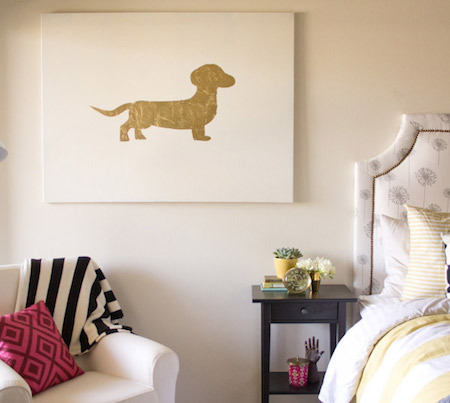 Making an image out of gold leaf can be a beautiful, fairly simple way to add a little shimmer to your decor. You can make your art in any size - you could use a large canvas as a background, or a smaller one. You will need some kind of canvas, though, as well as an idea of what shape (heart, star, puppy) you'd like to draw on. You can draw your shape right on the canvas or make a stencil. Now you're going to need some gold leaf adhesive (you should be able to get it at a craft store), which you will apply in a thin coat overtop of your shape. Then you can lay the gold leaf on. Once the gold leaf is on and dry, you can take a soft, dry brush and carefully wipe away the excess gold leaf along the sides of your shape. Careful, though - gold leaf has a tendency to get everywhere! Now you just have to choose the best place to hang your art! Ever wanted to make your own painting but been to intimidated to try? Take a chance and give it a shot! Again, you can buy a canvas of any size for your painting, but if you really want it to make an impression, your best bet is probably to go big. You'll also need some good quality paints. Acrylic paints in like colors (for example, blues and purples or reds and pinks) will make it a bit easier to keep your painting looking cohesive. 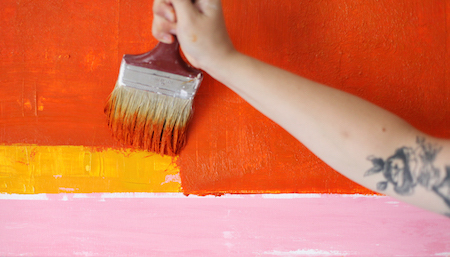 To start, use a big brush to spread one of your colors all around the edge of the canvas. You can then use a wide brush or a spatula to apply the other colors, one at a time. If you're looking to create a modern, abstract feel, apply your colors in thick lines or in geometric patterns. Pro tip: if you want to vary your colors just a little bit, feel free to mix your paints and see what you come up with. There you go, now you have a few ideas to start you off! If you're looking for more inspiration, take a look at some of your favorite art and see if you think you could make something similar. You can also look up loads of great DIY ideas online, many of which include instructions. Go ahead, make some art! 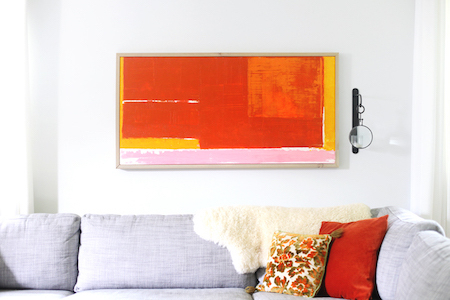 Have you ever tried a DIY art project at home? Our Kidzworld readers want to hear all about it!